Meiresonne, N. Y., Alexeeva, S., van der Ploeg, R. and den Blaauwen, T. (2018). Detection of Protein Interactions in the Cytoplasm and Periplasm of Escherichia coli by Förster Resonance Energy Transfer. Bio-protocol 8(2): e2697. DOI: 10.21769/BioProtoc.2697. This protocol was developed to qualitatively and quantitatively detect protein-protein interactions in Escherichia coli by Förster Resonance Energy Transfer (FRET). The described assay allows for the previously impossible in vivo screening of periplasmic protein-protein interactions. In FRET, excitation of a donor fluorescent molecule results in the transfer of energy to an acceptor fluorescent molecule, which will then emit light if the distance between them is within the 1-10 nm range. Fluorescent proteins can be genetically encoded as fusions to proteins of interest and expressed in the cell and therefore FRET protein-protein interaction experiments can be performed in vivo. Donor and acceptor fluorescent protein fusions are constructed for bacterial proteins that are suspected to interact. These fusions are co-expressed in bacterial cells and the fluorescence emission spectra are measured by subsequently exciting the donor and the acceptor channel. A partial overlap between the emission spectrum of the donor and the excitation spectrum of the acceptor is a prerequisite for FRET. Donor excitation can cross-excite the acceptor for a known percentage even in the absence of FRET. 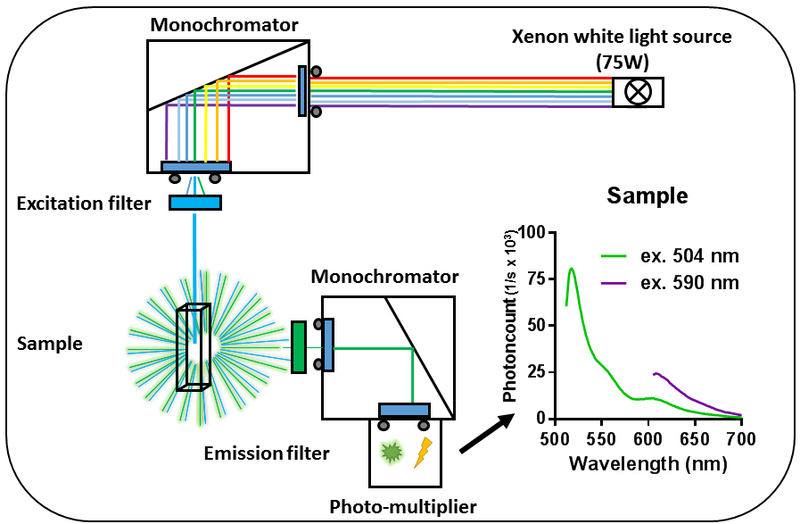 By measuring reference spectra for the background, donor-only and acceptor-only samples, expected emission spectra can be calculated. Sensitized emission for the acceptor on top of the expected spectrum can be attributed to FRET and can be quantified by spectral unmixing. Determining how and which proteins interact to sustain life is at the core of molecular biology research. Many in vitro methods exist but may result in false positives as the interactions are taken out of their biological context. An in vivo method is crucial for the verification of in vitro obtained results. Moreover, in vivo methods allow for the observation of the often, dynamic processes that take place in the cell. Fluorescent proteins (FP)s are ideal for in vivo experiments as they can be fused to proteins of interest making it possible to microscopically track the localization and dynamics of the fused proteins in living cells. Energy can be transferred between FPs by Förster Resonance Energy Transfer (FRET) provided they have compatible physical properties. The emission spectrum of a donor FP must overlap with the excitation spectrum of an acceptor FP and the distance between them should be less than 10 nm. The larger the spectral overlap and the smaller the distance between the donor and acceptor FP the more FRET can occur. The stringent distance dependence for FRET is ideal to detect direct protein-protein interactions as they also occur in the nanometer range, whereas indirect protein interactions are usually on a larger distance scale and not detectable by FRET. For this reason, it gives very few false positives but due to the physical requirements of the involved fluorophores, negative results could be false negatives. The advantage of using FPs for FRET measurements is that the chromophore is enclosed in a protein barrel and therefore much better protected from the environment than chemical chromophores. The fluorescence of the latter is extremely sensitive to environmental changes such as pH, salt, and solvents. Consequently, they often cannot be used reliably to measure FRET in a complicated environment like the living cell. A drawback of the 3-4 nm in diameter protein-barrel that encloses the chromophore in FPs is that it reduces the detectable distance between proteins to 1-6 nm. Since 5-7 nm is the typical size of proteins, it usually does not pose a problem, but can again result in false negatives. We have used a spectroscopy based FRET method to analyze the interaction between proteins in the cytoplasm and in the periplasm of Escherichia coli (Alexeeva et al., 2010; Fraipont et al., 2011; van der Ploeg et al., 2013 and 2015; Meiresonne et al., 2017) and showed that the technique is suitable for mode of action studies of antibiotics (van der Ploeg et al., 2015) and medium throughput screening (Meiresonne et al., 2017) using various FP FRET pairs. This bio-protocol describes how to perform our FRET assay in bacteria to determine protein-protein interactions by spectral unmixing. Although this protocol is written for E. coli, the method of spectral unmixing is suitable for any organism, provided fusion proteins can be expressed in the species and fluorescence spectra can be collected. 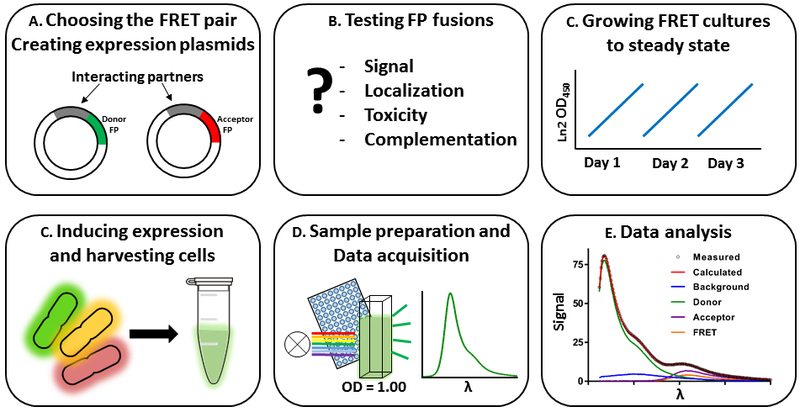 The protocol describes how to perform FRET experiments by 3 approaches: 1) Measurements on fixed cell using a fluorometer, the initial determination of protein interactions. 2) Measurements on fixed cells in the plate reader for the faster detection of already confirmed protein interactions that provide clear fluorescence signals. And 3) for established interactions, measurements on living cells grown in the plate reader. For instance, to monitor the real time inhibition of a particular interaction. Note: All H2O in the protocol indicates water of 11.5 MΩ from Water purification system. Note: A PMT that will reliably detect fluorescence spectra up until 700 nm will be suitable for the described protocol. Note: This product has been discontinued. Filters with similar transmission properties can be used. The FRET method from beginning to end encompasses several steps, which are discussed per subject. The procedure and sections are outlined in Figure 1. Figure 1. Workflow of the bacterial spectral-based FRET method. The labeling of the panels corresponds to the section describing the specific protocols. A. Choosing the suitable FRET-pair and creating expression plasmids. B. Testing the constructed plasmids for functionality. C. Growing cultures steady state, inducing expression of the FRET constructs and harvesting cells. D. Sample preparation and data acquisition. E. Analysis of the data. Before starting FRET experiments, the most suitable FRET-pair should be selected, which will depend on the type of experiments that are planned. 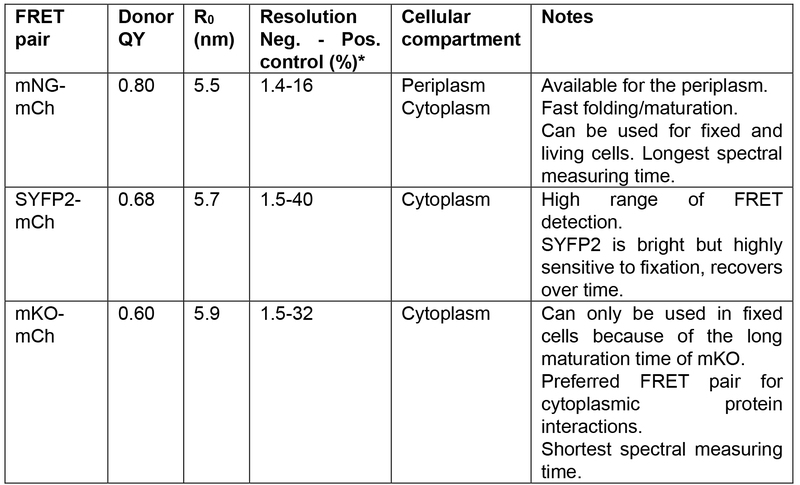 For instance, the compartment of the assayed protein-protein interaction or the desire to do in vivo measurements influence this choice (Table 1). In this bio-protocol mCherry (Shaner et al., 2004) is used as an acceptor FP for either mNeonGreen (Shaner et al., 2013) (mNG), super yellow fluorescent protein 2 (Kremers et al., 2006) (SYFP2) or monomeric Kusabira-Orange (Karasawa et al., 2004) (mKO) donor FPs. All combinations have their specific strengths and drawbacks. These proteins have been described as monomers and usually do not have a strong propensity to aggregate (Cranfill et al., 2016). Theoretically, the FRET pair with the largest Förster radius (R0) will result in the highest FRET values. The R0 value is a measure for the distance at which 50% energy transfer occurs from the donor to the acceptor fluorophore (Figure 2). This is determined by the overlap between the donor emission spectrum and the acceptor excitation spectrum, their respective quantum yield, extinction coefficient and orientation. Figure 2. Förster radii of the described FRET pairs. Plotted theoretical FRET efficiencies as a function of chromophore distance for the mNG-mCh, SYFP2-mCh and mKO-mCh FRET pairs using the spectral properties in Table 1. On the right, the zoomed-in graph shows the R0 or the distance between the fluorophores that will yield 50% energy transfer. Of the FRET pairs described here mKO-mCh has the highest R0 value with 5.9 nm. However, mKO has a long maturation time meaning that, although it is produced by the cells and its tertiary structure has folded, the amino acids that form the chromophore need time to rearrange their covalent bonds to be able to fluoresce, which is termed maturation. FRET experiments with not fully matured FPs can therefore lead to unbalanced signal acquisition and faulty subsequent calculations. If allowing for maturation time is no problem, then the mKO-mCh pair is preferred for cytoplasmic FRET experiments given its good dynamic range and least time consuming measuring time (Alexeeva et al., 2010; Fraipont et al., 2011; van der Ploeg et al., 2013). The SYFP2-mCh FRET pair has a slightly lower R0 value (5.7 nm) but will emit strong SYFP2 fluorescence, which would provide sufficient signal for interactions that occur between proteins of relatively low copy numbers per cell (van der Ploeg et al., 2015). With the good folding and maturation properties of SYFP2 live FRET should be possible using the SYFP2-mCh pair although only experiments with fixed cells were attempted yet. If the SYFP2-mCh FRET pair is used and the cells are fixed, then the SYFP2 signal needs to recover its fluorescence and the direct measuring of samples is not possible. Regardless, in our hands the SYFP2-mCherry FRET pair provided the broadest range of FRET detection. This is surprising as the mKO-mCh pair has a higher R0 but possibly SYFP2 performs somewhat better due to its high fluorescent intensity. The SYFP2-mCh pair could therefore be more suitable than the mKO-mCh pair if smaller differences in FRET values need to be measured for less abundant proteins. Of the three described FRET-pairs mNG-mCh has the lowest R0 value (5.5 nm) and consequently a modest detection range but it also has advantages. At the moment mNG is the only useful donor to mCherry that folds and matures in the periplasm. The mNG-mCh FRET pair could be used real time in living cell FRET experiments in both the cytoplasm and the periplasm (Meiresonne et al., 2017). Furthermore, the mNG-mCh FRET pair results obtained by spectral unmixing could be confirmed by a fluorescence life time based detection method (Meiresonne et al., 2017). *As described in the original papers (Alexeeva et al., 2010; van der Ploeg et al., 2013 and 2015; Meiresonne et al., 2017). For the R0 values presented in Table 1, the originally published extinction coefficient of 72,000 M-1 cm-1 of mCh was used (Shaner et al., 2004). Variation occurs in the description of FP extinction coefficients based on detection accuracy and sample conditions. The ever-improving field of FP research shows that the extinction coefficient of mCh is more in the range of 85,000 M-1 cm-1 (Cranfill et al., 2016; Bindels et al., 2017). Similarly, the quantum yield of mKO has been reported to be higher than originally thought (0.77) (Cranfill et al., 2016). This would lead to higher R0 values and different calculations for each of the described FRET pairs. Different FP pairs, especially CFP-YFP, have been used for bacterial FRET. For more information, see references (Sourjik and Berg, 2002; Detert Oude Weme et al., 2015; Sieger and Bramkamp, 2015). Bacterial genes encoding a protein of interest are fused to a gene encoding one of the described fluorescent proteins and expressed from an inducible expression vector. Any plasmid expression system can be used, provided that the plasmids are compatible (different origins of replication and different antibiotic resistance markers) and the expression level is low (typically 2,000 copies of the protein) to avoid nonspecific interactions. To give the FP and the protein of interest some freedom of movement and reduce steric hindrance, it can be useful to add a linker between the FP and the protein. GGS repeats are often used but we also have good results with ARNNNN and other amino acid sequences. Another consideration is the choice for an N- or C-terminal fusion. For instance, N-terminal fusions of proteins that encode signal sequences for downstream transport or processing should be avoided or circumvented. Additionally, the N- or C-terminus of a protein may be essential for its normal localization or functionality. Procedure B discusses testing the created fusions. The sequence of the plasmid should be confirmed before further experiments. A description of cloning and transforming E. coli with plasmids is beyond the scope of this protocol but other Bio-protocols like ‘[BIO101] Standard cloning’ and ‘[BIO101] The Inoue Method for Preparation and Transformation of Competent E. coli: “Ultra Competent” Cells’ (He, 2011; Im, 2011) may be useful. Ideally the FP-fusions should be fully functional and expressed at levels close to their native levels while still resulting in measurable fluorescence intensities. Once the fusions are created on a plasmid, the expressed products should be tested for their effects on phenotype, fluorescence and correct cellular localization. If no fluorescence is observed, degradation of the FP may be assessed by Western blot analysis. Perhaps the fusion disrupts normal localization, functionality and interactions of the protein of interest. This may be amended by modifying the length of the linker or switching the position of the FP. Some proteins may neither be functional as N nor as C-terminal fusion but will work as a sandwich fusion (van der Ploeg et al., 2015). An FP-fusion should complement the loss of function from a deletion or depletion strain of that same protein. Complementation testing will depend on whether the loss of the gene results in a phenotype. If no complementation experiments are possible, FRET experiments can be done in either a wild-type or deletion background but it should be kept in mind that the fusion protein may not be functional and results could be misinterpreted. Note: Plasmid-based FP-fusions are a great way of quickly testing localization or the interaction of proteins of interest. However, plasmid-based complementation is not always possible due to stoichiometry imbalance. In such cases the FP-fusion could be inserted in the chromosome at the original locus. In fact, chromosomal insertions of well-established FRET partners would be preferred for easy assays. However, this would also require chromosomal references in an isogenic background because bacteria can respond differently to plasmid and chromosomal based protein expression with respect to growth differences in and possible autofluorescence due to plasmid maintenance. When the FP fusion proteins are ready for use, competent cells can be transformed with the donor and acceptor expressing plasmids. Any E. coli strain should be suitable. Because we are interested in proteins that affect morphology, we prefer to use wild-type strains like MC4100 or BW25113 that are morphogenetically homogenous. Note that, if deletion strains are used the references and controls should be in the wild-type variant. The FRET assay described, requires at least three reference samples that are expressed in cells of the same genetic background as the assessed interaction. Strongly advised is the use of positive and negative controls consisting of a plasmid expressing the donor FP fused to the acceptor FP and two plasmids expressing the donor or acceptor FPs fused to unrelated proteins that are known not to interact, respectively. The best controls are expressed in the same compartment as where the protein-protein interaction takes place to be able to assess molecular crowding effects. A list of samples for a minimal FRET experiment is shown in Table 2.
aTo detect the interaction between two proteins of interest at least three references are required. Positive and negative controls are advised. The described protocol is for two compatible plasmids that have a p15 origin of replication combined with chloramphenicol resistance and a ColE1 origin of replication combined with ampicillin resistance. Both plasmids have a weakened trc99A promoter and two terminators. Bacterial cells that are grown in rich medium often contain a high concentration of autofluorescing molecules that decrease the signal to noise ratio. For that reason, the cells are grown in minimal medium and FRET experiments performed in rich medium are discouraged. To allow comparison of the various bacterial cultures expressing the FP pairs the cells are grown to steady state in about 20 generations before the expression of the proteins is induced (Figure 3). This assures identical autofluorescent backgrounds in all samples. After induction of expression for at least 2 generations the cells are fixed and harvested. Day 0. Prepare starter cultures of all strains required to run your FRET experiment in 5 ml TY + ampicillin + chloramphenicol + 0.5% glucose medium at 37 °C while shaking until bacterial growth becomes visible. Note: Glucose is added to the medium to repress the expression of the lacIq controlled gene from the plasmids. Use the starter cultures to inoculate 25 ml (1:250) of Gb1 medium + ampicillin + chloramphenicol and continue overnight growth at 28 °C while shaking. Day 1. Dilute the overnight cultures 1:250 in fresh Gb1 medium + ampicillin + chloramphenicol and continue growth at 28 °C while shaking. Note: From now on periodically measure and note OD450 values of the cultures and do not let it reach above 0.2. If the cultures approach this value dilute with fresh pre-warmed medium. Calculate the doubling time (TD) for all grow cultures using the provided Excel sheet ‘Growth calculation.xlsx’ and use it to calculate the dilution factor to reach OD450 values of 0.1 the next morning when the experiment is continued. Day 2. Repeat the growing in fresh Gb1 medium + ampicillin + chloramphenicol while keeping the OD450 values below 0.2 and dilute for the next morning like in Step C4. Day 3. Repeat the growing in fresh Gb1 medium + ampicillin and chloramphenicol while keeping the OD450 values below 0.2 and dilute for the next morning like in Step C4 but this time aim for an OD450 value of 0.025 in 35 ml fresh Gb1 + ampicillin + chloramphenicol. Day 4. Measure OD450 values of the cultures and if they are around 0.03-0.04 induce expression from the plasmids by adding IPTG at an appropriate concentration (e.g., 10-20 µM) and continue growth. When the cultures approach OD450 values of ~0.2, prepare a sufficient amount of FAGA fixative (see Recipes). Note: The total volume of FAGA needed differs depending on the total volume of the to-be-fixed cultures, 1 ml of FAGA is required to fix 12.5 ml of culture. When the cells reach OD450 values of 0.2, fix the cells in the shaking water bath with FAGA, depending on how much of the culture’s volume is left for 10 min. Decant the fixed cultures in 50 ml Falcon tubes and pellet the cells by centrifugation for 10 min at 6,300 x g at room temperature (Eppendorf 5804 R). Discard the supernatant and wash 3 x with 1 ml PBS in a 1.5 ml Eppendorf tube centrifuging for 5 min at 4,600 x g at room temperature in a tabletop centrifuge (Eppendorf 5424 R). Resuspend the last pellet in 1 ml of PBS and depending on the FRET pair that is used incubate o/n at 37 °C or over weekend at 4 °C to allow chromophore maturation (mKO-mCh) or store the samples at 4 °C until ready for measuring (SYFP2-mCh & mNG-mCh). Note: SYFP2 and mNG fold fast and their chromophore (re)matures quickly so direct measurements could be considered, but it is more practical to do the spectral measurements the day after. Figure 3. Example of steady state growth. Flask culture growth curves of MC4100 based E. coli cultures were grown to steady state in Gb1 at 28 °C expressing periplasmic FP-fusions. The circles represent the time points at which overnight dilutions were made. At day 4 the cultures were induced with IPTG (arrow) to express periplasmic mNG- or mCh-fusions. The EV (Empty Vector) culture does not express any FP and serves as a control. The X-axis is given in ln OD450 to signify exponential growth. Cells were fixed and harvested after at least two mass doublings (asterisk). This figure was adapted from Meiresonne et al., 2017. Pellet the cells as described in Step C10 and resuspend in 1 ml PBS. Prepare at least 1,300 µl of samples of with OD450 values of 1.00 ± 0.005 by diluting the cells with fresh PBS and add 1,200 µl to the stirred quartz cuvette. The dilution can be made inside the photospectrometer; the more equal the OD450 values are; the more reliable will be the results. Do not forget to add the magnetic stirrer to the cuvette before measuring. Measure the acceptor emission spectrum using the settings and optical filters indicated in Table 3 and described in ‘Measuring spectra using a fluorometer–Fluorometer settings and practical setup’. Measure the donor emission spectrum using the settings and optical filters indicated in Table 3 and described in ‘Measuring spectra using a fluorometer–Fluorometer settings and practical setup’. Note: It is advisable to measure the acceptor and donor spectra of each sample in the same order to prevent possible differences in FP bleaching. Repeat Steps D2 to D4 for each sample and also measure a blank PBS only sample at the start of the measurement and the end of all measurements. This allows you to verify any change in the instrument response. Save the data in any convenient file format that can be exported to Microsoft Excel. Before and between receiving a sample, quartz cuvettes need to be thoroughly cleaned by performing steps outlined in the cleaning protocol below. By saving the OD450 = 1.00 samples they can directly be reused for spectral measurements with the plate reader described in ‘Measuring spectra with the plate reader’. aFilters with similar transmission properties can be used. Emission spectra are measured using a fluorometer. The fluorometer should excite a sample with a narrow band wavelength, which then emits fluorescence that is measured. A schematic overview of a fluorometer is shown in Figure 4. The light source emits white light, which passes a slit to the excitation monochromator where it is separated into its wavelength components. The light passes a slit before passing the excitation filter and hits the sample suspension in the quartz cuvette. The cells in the sample will be excited and emit light in every direction but excitation light also scatters from them. At an angle of 90°, the scattered light is filtered by an emission filter and the fluorescence emission passes a slit entering the emission monochromator. Here, the emission wavelengths are scanned and pass the last slit before entering a photomultiplier where quanta of photons are being transformed into a measurable electrical current. The resulting emission spectra are the raw data needed to calculate FRET. The measurement of different FPs requires different excitation, filter and measurement settings which are shown in Table 3. Slit widths are usually set to 6 nm and generally give a good result if the fluorescent proteins are expressed well. Smaller slit widths result in more specific measurements but will also let less light pass to be detected so slits should only be more closed when fluorescent signals are very high. If the fluorescent signals are low, the slits could be widened but this will result in less specific signals. When background fluorescence is an issue, this will increase in a proportional manner. The white light source has to heat up before the light output will be stable. Thirty minutes after turning it on check whether the power of the lamp is 75 W and if not adjust. Other fluorometers will have different requirements. The use of other white light sources or equipment may require different preparations. Figure 4. Schematic overview of measuring a sample in the fluorometer. The double black and gray circles at the monochromators represent adjustable slits. Profusely rinse the inside and outside of the cuvette with H2O. Carefully shake off the excess H2O. Profusely rinse the inside and outside with 70% ethanol. Carefully shake off the excess 70% ethanol. Repeat Steps 1 to 4 (Protocol cleaning quartz cuvettes), three times. Profusely rinse the inside and outside with 96% ethanol. Carefully shake off the excess ethanol 96%. Blow dry the cuvette with compressed air. Polish the cuvette with lens tissue to get rid of accidental smudges like for instance fingerprints. Now the cuvettes are properly cleaned and can hold a sample for measurement. The stirrer beans are washed by the same rinsing protocol in the palm of your hand. After the last measurement wash all cuvettes and stirrer beans one more time and then submerge them in 2% Hellmanex III for storage. If cuvettes are not needed for longer time periods, store them clean and dry. Quartz cuvettes should be cared for meticulously as they are fragile and expensive. Only touch the cuvettes with your fingers close to the opening to prevent finger prints on the important part of the quartz. 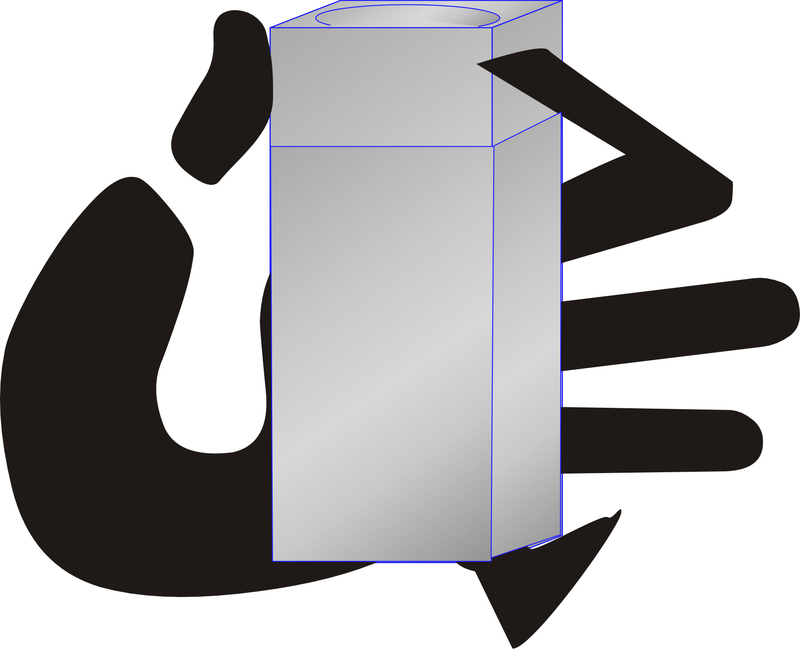 Carry the cuvette between your index finger and thumb while supporting the bottom with your pinky or ring finger as shown in Figure 5. A convenient way of measuring the emission spectra of your samples is by using a fluorescence plate reader. A word of caution is in order as the sensitivity of most fluorescence plate readers is lower than that of a dedicated fluorometer and provide weaker fluorescence signals. If fluorescence is low, the fluorometer should be used. This Bio-protocol describes the use of the BioTek synergy MX plate reader, which has excitation and emission monochromators without the possibility for additional optical filtering. In addition, this plate reader has slits with a minimal opening of 9 nm. The, on average, lower signal to noise and less specific signals from a plate reader may therefore lead to unmixing problems. It is thus recommended to first firmly establish FRET interactions using a fluorometer and then confirming them using the plate reader. If results are reproducible, experiments can be done with the plate reader only. Prepare samples with OD450 values of 1.00 ± 0.005 like described in Steps D1 and D2. Dispense 200 µl replicates of the samples in a glass bottomed black walled 96 wells plate. If eight replicates are made, there is space for 11 prepared samples and 1 PBS measurement in a 96-well plate. Measure the donor and acceptor emission spectra of each well using the settings shown in Table 4. Export the emission data in an Excel compatible format and plot the replicates to check for obvious outlying data. Exclude the possible outliers based on large and obvious deviations from the other replicates and average the acceptor and donor emission spectra. These data will be used for spectral unmixing and FRET calculations. *Optimal gain may differ between experiments. It is better to have slightly lower signals than to oversaturate the detector. Note: Measuring the OD450 values in the plate reader before the spectral measurements will give an indication how similar the samples are to each other. Grow your cells like described in Steps C1 and C2 in Procedure C for the growth of the samples. Dilute the Gb1 cultures to OD450 = 0.005 in at least 2,000 µl fresh Gb1 pre-warmed to 28 °C. Note: This is an important step and needs to be carefully done as the cultures now have to grow almost identically and corrections are virtually impossible. Cultures that have largely different growth rates upon expressing fusion proteins could give unreliable measurements compared to the other cultures and should be avoided. Dispense the diluted cells in 200 µl replicates in a black walled 96 wells plastic plate and continue growth in the plate reader at 28 °C while shaking at medium setting. Note: In our experience, it is better to use plastic bottomed black walled plates for these experiments as the glass bottomed ones give more variable OD450 readings after some growth time. As OD values approach OD450 = 0.1, dilute all wells 1:2 with fresh pre-warmed Gb1 medium containing IPTG to an end-concentration appropriate for regular experiments and continue growth. Pay close attention to the growth of the cells, as the cultures leave the exponential phase start spectral measurements as described in Steps c-e of the ‘Protocol plate reader FRET for fixed cells’ above in the current plate. Note: Measure OD450 values before and after the spectral measurements to observe possible outliers that should be excluded. An example of a full in vivo plate reader FRET experiment is shown at the end of Procedure E in Figure 8. When the acceptor and donor emission spectra of all samples are measured either by the fluorometer or by the plate reader, they can be unmixed. Spectral unmixing dissects the emission data into its components based on the references that were provided. The donor channel is composed of background emission, donor-only emission, directly excited acceptor emission and possible FRET acceptor emission (Figure 6). The acceptor channel is composed of background emission and acceptor-only emission. Form this spectrum the amount of acceptor in the sample can be calculated using the background and reference spectra for the unmixing of the spectra. Knowing the amount of acceptor fluorescence, it can be calculated how much fluorescence is expected from the acceptor due to cross-excitation of the donor and the acceptor in the sample that contains both. Using the reference spectra and the knowledge on the amount of acceptor in the sample, the emission spectrum for a sample can be dissected into the background spectrum, the donor spectrum and the acceptor spectrum. Remaining is a spectrum of identical shape as the acceptor spectrum that cannot be accounted for if no sensitized emission (energy transfer) had occurred. This extra acceptor spectrum corresponds to the amount of energy transfer. The supplementary data of Alexeeva et al. (2010) gives a detailed description of the calculations based on biophysical work beyond the scope of a protocol (Clegg, 1992; Clegg et al., 1992; Wlodarczyk et al., 2008; Gadella, 2009). 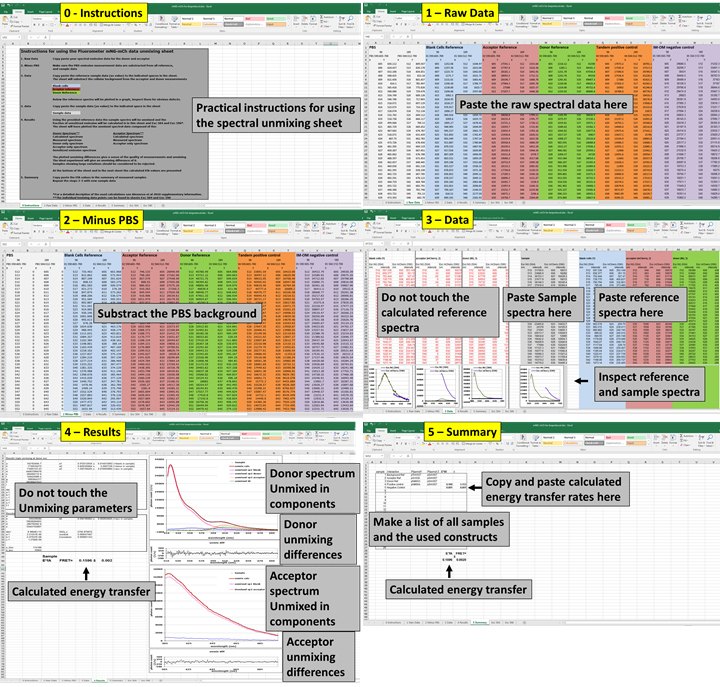 In the supplementary information, ready-to-use Excel sheets are provided to calculate FRET efficiencies for each of the described FRET pairs. ‘mNG-mCh.xlsx’ ‘mNG-mCh plate reader.xlsx’ ‘SYFP2-mCh.xlsx’ and ‘mKO-mCh.xlsx’. Figure 6. Principle of the periplasmic FRET assay. A. Excitation and emission spectra of mCh and mNG, indicating the wavelengths used to measure the acceptor channel (left) or the donor channel (right). The bold dotted line represents the used excitation wavelengths. The hatched blue area represents the spectral overlap between the mNG emission spectrum and the mCh excitation spectrum. The gray shaded area represents the wavelengths for which the emission was measured. B. Samples measured to calculate periplasmic FRET. References of background, mCh, and mNG are needed to calculate their contributions to the FRET within a sample. C. Unmixing of the periplasmic tandem FRET sample, showing the measured spectrum as black dots (Peri-tandem) and the calculated spectrum as a solid red line (Unmixed Calc.). The measured spectrum for the acceptor is composed of the background fluorescence (Unmixed Empty cells) and the amount of mCh (Unmixed Acceptor) present in the sample excited at 590 nm. The direct excitation of the acceptor is used to determine the amount of acceptor present in the sample. This amount is then used to calculate how much extra acceptor (sensitized emission) is detected in the donor excited sample. The measured spectrum for the donor contains the background (Unmixed Empty cells), mNG (Unmixed Donor), and mCh (Unmixed Acceptor) fluorescence and sensitized emission (Unmixed SE), which is the extra fluorescence that the unmixing algorithm cannot attribute to direct excitation of mCh. D. The low residual difference between the measured and calculated spectra is a measure of the quality of unmixing. This figure was originally published in Meiresonne et al., 2017. An overview of how the unmixing process would appear on the computer screen is shown in Figure 7. High resolution screenshots are available in the supplementary data. Note: Be aware that the raw data may have different output formats depending on the equipment used and adjust accordingly. Copy the spectral data in the appropriate excel sheet 1 ‘Raw data’. Subtract the PBS measurement from all samples in sheet 2 ‘Minus PBS’. Copy the empty vector, acceptor reference and the donor reference in the indicated places in sheet 3 ‘Data’. This will automatically subtract the background signal from the acceptor and donor reference spectra. Copy sample data to the indicated place in sheet 3 ‘Data’ the sheet will unmix these spectra based on the given references. Note: The reference and sample spectra are plotted at the bottom of sheet 3 for inspection. Inspect the unmixing overview on sheet 4 ‘Result’ as described further below. Copy paste the results to sheet 5 ‘Summary’. Repeat Steps 4-6 for the remaining samples. Figure 7. The unmixing process for the calculation of FRET efficiencies as it would appear on the screen. Raw donor and acceptor unmixing calculations that will not be directly used are shown in the high-resolution screenshots in Supplementary file ‘Unmixing screens.pptx’. What determines a good measurement? Spectral unmixing is highly dependent on clear fluorescent signals that should be measured under identical conditions. The donor and acceptor reference spectra are obtained by subtracting the PBS and empty cells data from their respective emission measurements as described in ‘Protocol using the unmixing sheets’. This should yield a clean emission spectrum of the donor only or the acceptor only FP. Sometimes spectra that do not resemble the measured FP anymore or even negative spectra of especially the donor can be seen. This can be caused by strong levels of autofluorescence in the empty cells sample and low FP signals in the reference samples. If one of the references is not good, the unmixing of the spectra will not give trustworthy results. Alternatively, reference spectra of a previous measurement may be used to still get a rough indication of the FRET values of the samples. It is not advised to use these values as definite and the experiment needs to be repeated to yield trustworthy data. When the experiment results in good references, sample data can be unmixed. Emission signal that could not be attributed to the acceptor spectrum is called the unmixing difference. The unmixing difference is a good measure for the quality of the measured FRET spectra and in an ideal experiment it should be zero. More realistically, it should be a small percentage of the measured spectra as shown in Figures 6D and 8D. Figure 8. Full in vivo plate reader FRET experiment. A. Growth curves of cells grown in Gb1 at 28 °C show only small differences in doubling time for the periplasmic tandem mNG-mCh. OD450 values of all well-cultures were within ~10% of each other before measuring fluorescent spectra. The arrow indicates the time point at which induction of the constructs was started by 1:2 dilution. B. Average normalized fluorescence spectra of periplasmic references with standard deviation error bars showing only small intensity variation between replicates. C. Good quality unmixing of the acceptor channel on the left and of the donor channel on the right of the average periplasmic tandem sample with average references suggests reliable calculations of sensitized emission. D. Difference between the measured spectrum and the calculated spectrum showing only little unmixing differences for the acceptor and donor. This figure was originally published in Meiresonne et al., 2017. This bio-protocol describes how to prepare, perform and analyze in vivo bacterial FRET experiments. At the relevant sections (Procedure E), information is provided on data analysis and references to in-depth technical information are provided. The significance of the obtained FRET values can be calculated using standard confidence interval statistical approaches. The FRET values should be significantly higher than the values obtained from non-interacting samples due to crowding. For this analysis, standard t-tests can be used. Note: For BW25113, TB28 and MG1655 based E. coli strains. Note: After sterilization, the MM3 will show a red precipitation that should be ignored. Adaptations of this bio-protocol have been used in the following publications (Alexeeva et al., 2010; Fraipont et al., 2011; van der Ploeg et al., 2013 and 2015; Meiresonne et al., 2017). The authors would like to thank prof. dr. Theodorus W. J. Gadella for developing the original Excel unmixing sheet (Alexeeva et al., 2010) and critically reading the manuscript and Laureen M. Y. Mertens for testing out the unmixing protocol. NYM was supported by the NWO, ALW open program (822.02.019), Svetlana Alexeeva by the NWO, ALW ‘Van Molecuul tot Cel’ program (805.47.200) and RvdP by the European Commission DIVINOCELL project (FP7-Health-2007-B-223431). The authors declare no conflict of interest. Alexeeva, S., Gadella, T. W., Jr., Verheul, J., Verhoeven, G. S. and den Blaauwen, T. (2010). Direct interactions of early and late assembling division proteins in Escherichia coli cells resolved by FRET. Mol Microbiol 77(2): 384-398. Bindels, D. S., Haarbosch, L., van Weeren, L., Postma, M., Wiese, K. E., Mastop, M., Aumonier, S., Gotthard, G., Royant, A., Hink, M. A. and Gadella, T. W., Jr. (2017). mScarlet: a bright monomeric red fluorescent protein for cellular imaging. Nat Methods 14(1): 53-56. Clegg, R. M. (1992). Fluorescence resonance energy transfer and nucleic acids. Methods Enzymol 211: 353-388. Clegg, R. M., Murchie, A. I., Zechel, A., Carlberg, C., Diekmann, S. and Lilley, D. M. (1992). Fluorescence resonance energy transfer analysis of the structure of the four-way DNA junction. Biochemistry 31(20): 4846-4856. Cranfill, P. J., Sell, B. R., Baird, M. A., Allen, J. R., Lavagnino, Z., de Gruiter, H. M., Kremers, G. J., Davidson, M. W., Ustione, A. and Piston, D. W. (2016). 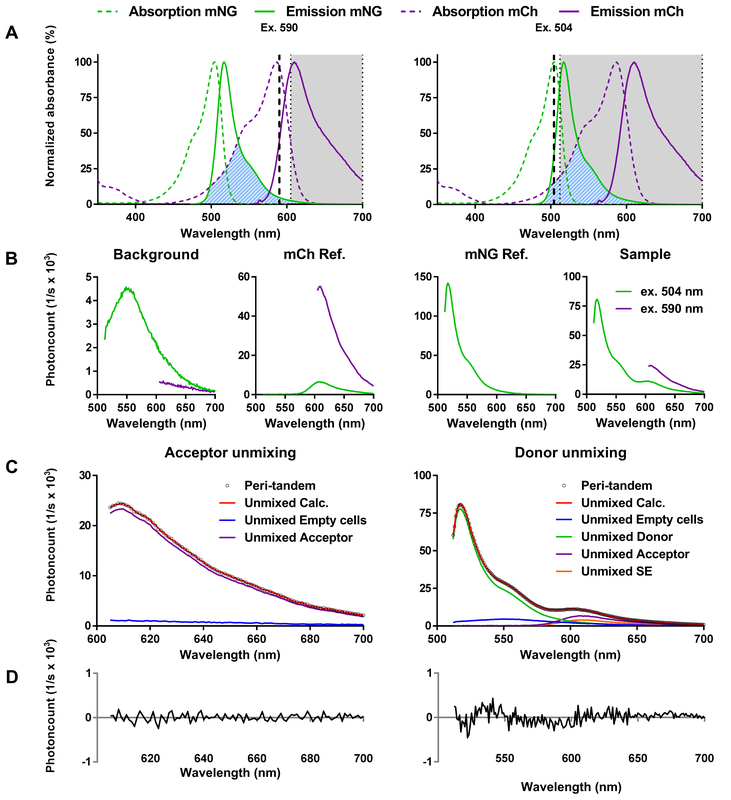 Quantitative assessment of fluorescent proteins. Nat Methods 13(7): 557-562. Detert Oude Weme, R. G., Kovacs, A. T., de Jong, S. J., Veening, J. W., Siebring, J. and Kuipers, O. P. (2015). Single cell FRET analysis for the identification of optimal FRET-pairs in Bacillus subtilis using a prototype MEM-FLIM system. PLoS One 10(4): e0123239. Fraipont, C., Alexeeva, S., Wolf, B., van der Ploeg, R., Schloesser, M., den Blaauwen, T. and Nguyen-Disteche, M. (2011). The integral membrane FtsW protein and peptidoglycan synthase PBP3 form a subcomplex in Escherichia coli. Microbiology 157(Pt 1): 251-259. Gadella, T. W. J. (2009). In: Theodorus, W. J. (Ed.). FRET and FLIM techniques. Elsevier. He, F. (2011). Standard DNA cloning. Bio-protocol 1(7):e52. Im, H. (2011). The inoue method for preparation and transformation of competent E. coli: "ultra competent" cells. Bio-protocol 1(20): e143. Karasawa, S., Araki, T., Nagai, T., Mizuno, H. and Miyawaki, A. (2004). Cyan-emitting and orange-emitting fluorescent proteins as a donor/acceptor pair for fluorescence resonance energy transfer. Biochem J 381(Pt 1): 307-312. Kremers, G. J., Goedhart, J., van Munster, E. B. and Gadella, T. W., Jr. (2006). Cyan and yellow super fluorescent proteins with improved brightness, protein folding, and FRET Forster radius. Biochemistry 45(21): 6570-6580. Meiresonne, N. Y., van der Ploeg, R., Hink, M. A. and den Blaauwen, T. (2017). Activity-related conformational changes in d,d-carboxypeptidases revealed by in vivo periplasmic forster resonance energy transfer assay in Escherichia coli. MBio 8(5). Shaner, N. C., Campbell, R. E., Steinbach, P. A., Giepmans, B. N., Palmer, A. E. and Tsien, R. Y. (2004). Improved monomeric red, orange and yellow fluorescent proteins derived from Discosoma sp. red fluorescent protein. Nat Biotechnol 22(12): 1567-1572. Shaner, N. C., Lambert, G. G., Chammas, A., Ni, Y., Cranfill, P. J., Baird, M. A., Sell, B. R., Allen, J. R., Day, R. N., Israelsson, M., Davidson, M. W. and Wang, J. (2013). A bright monomeric green fluorescent protein derived from Branchiostoma lanceolatum. Nat Methods 10(5): 407-409. Sieger B. and Bramkamp M. (2015). Interaction sites of DivIVA and RodA from Corynebacterium glutamicum. Front Microbiol 5: 738. Sourjik, V. and Berg, H. C. (2002). Receptor sensitivity in bacterial chemotaxis. Proc Natl Acad Sci U S A 99(1): 123-127.
van der Ploeg, R., Goudelis, S. T. and den Blaauwen, T. (2015). Validation of FRET assay for the screening of growth inhibitors of Escherichia coli reveals elongasome assembly dynamics. Int J Mol Sci 16(8): 17637-17654.
van der Ploeg, R., Verheul, J., Vischer, N. O., Alexeeva, S., Hoogendoorn, E., Postma, M., Banzhaf, M., Vollmer, W. and den Blaauwen, T. (2013). Colocalization and interaction between elongasome and divisome during a preparative cell division phase in Escherichia coli. Mol Microbiol 87(5): 1074-1087. Wlodarczyk, J., Woehler, A., Kobe, F., Ponimaskin, E., Zeug, A. and Neher, E. (2008). 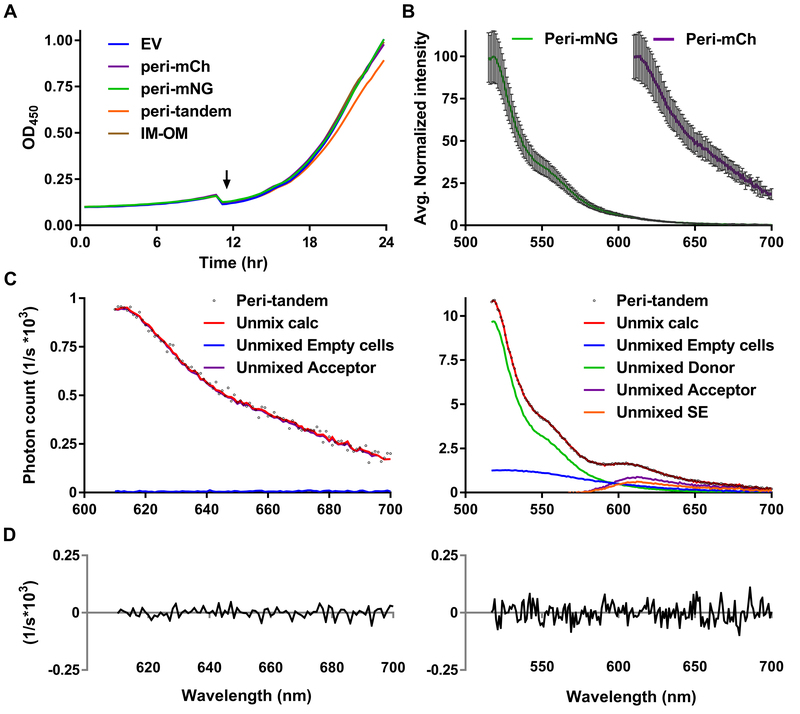 Analysis of FRET signals in the presence of free donors and acceptors. Biophys J 94(3): 986-1000. How to cite: Meiresonne, N. Y., Alexeeva, S., van der Ploeg, R. and den Blaauwen, T. (2018). Detection of Protein Interactions in the Cytoplasm and Periplasm of Escherichia coli by Förster Resonance Energy Transfer. Bio-protocol 8(2): e2697. DOI: 10.21769/BioProtoc.2697.